Target training programs with adaptation to the needs of the enterprise. Skills development in the field of engineering technology and quality management. Training for operators and engineers to work on CNC-equipment. Soft skills and self-management training for engineers. Seminars, workshops and short courses. Modern specialist has to know a lot of things and to be able to do a lot of tasks as well as constantly evolve. The ability to learn fast and to find out needful knowledges, and sometimes to create new knowledge and skills, is necessarily. Is it possible to training this ability? Yes, it is. Bauman graduates have been always known for their ability to solve problems and find solutions, even those which they haven’t been directly taught. Our programs are built on years of experience and constantly updated. 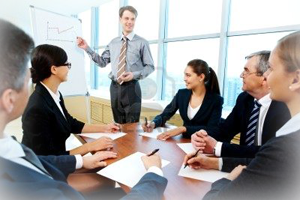 All practical training programs are carried out by experts with high qualifications in this field. We train you to develop yourself.